Before I get too far I want to clarify, inbound links ARE important for a good search engine optimization (SEO), especially for small businesses that need the extra push. We commonly get questions from regarding SEO link building services and it's pretty clear that this is a topic that is still misunderstood by many business owners and most of them have been going about it the wrong way. What they do know is that they've heard to words "links" and "SEO" in the same discussion, but some have no further understanding than that so here's a quick overview. What is a Good Link for SEO? A link that provides value to your SEO strategy is one that comes from another website linking to yours. The other website should be fairly closely related in topic to your products/services. The other website should be trustworthy and quality, meaning that website doesn't tend to spam or have garbage content. The best links are also used naturally in content, not part of a links page with 50 other links on it. They are also text and the text used is best if it's related to your product or service, not "click here". Keep in mind that many other websites linking to you might use what's called a "nofollow". This means they link to you, but aren't necessarily willing to vouch for you. Don't worry, it's nothing personal. The popularity of "nofollow" grew because spammers and shady SEOs took advantage of it in the past (and still try). That's a quick overview on the types of links you are looking for. 1. Reaching out and asking strangers for links is a waste of time and you won't get quality links. If this is a tactic you've either hired someone to do or you do yourself, you are wasting your time. You can send 1,000 emails and maybe get 5 people to respond and maybe 1 or 2 of those to actually post a link. The 1 or 2 that do may be people that are link happy, linking to everyone that reaches out to them...thus reducing the value of these links. I also want to mention, getting emails asking for links is SUPER ANNOYING! 2. Asking friends and acquaintances is probably not getting you anywhere. No offense, but you probably don't have that many friends or acquaintances with a website that is willing to link to you. And remember, you need links from RELATED websites. If a site is related, the visitors of that website should find value in clicking the link to yours...it's not just there to be a link. 3. Google wants links to grow naturally and they are better at spotting unnatural links. When I say grow naturally I mean you shouldn't gain 50 links in one night unless you have earth shattering content that you posted. If you are focusing on getting as many links as you can as quickly as you can, you are doing it wrong. 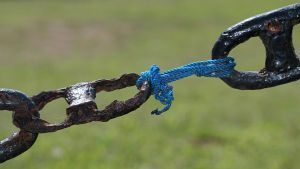 A few good quality links is better than 100 poor quality links! 4. You are probably getting links to your homepage, but not internal pages. Getting a link to your homepage is fine, but eventually those will happen anyways. Creating valuable content that provides answers to solutions will get people to link right to that page, an internal page not your homepage. If haven't started blogging or content marketing, now is the time to start...people won't link to your capabilities page. The more links you have to internal pages, it gives those pages additional power to rank. 5. You're hiring someone offering "link building" services. So What Can You Do to Build Links? If you do inbound marketing right, links will come. With inbound marketing you are creating valuable content and building relationships. You won't have to ask people for links as they will start to grow because you are doing things right. Be patient, it won't happen overnight but that's how Google wants it to happen anyways. Also remember, you must be doing inbound marketing right, not just dabbling. If you are recreating a blog post that's been created 100 other times, you need to revisit your content strategy. This should be good news to you. Now you can focus on inbound marketing and not worry about spending time or money on building links!